The sun bear is found primarily in the rainforests of Southeast Asia and is believed to be in the following countries: India, Bangladesh, Myanmar (formerly Burma), Thailand, Cambodia, Vietnam, Indonesia, Malaysia, Brunei , and Laos. Laos is thought to be one of the last strongholds for the sun bear because of its rugged terrain, scarcity of human population, and abundance of forested area. 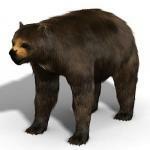 The sun bear used to inhabit China. However, that is now thought to be doubtful. The one subspecies of sun bear (Helarctos malayanus euryspilus) is found only on the island of Borneo. In Canada, black bears still inhabit 85 percent of their historic range from Northern Alaska to the east coast. They then become more and more dispersed across the United States as you go farther south. They are known to inhabit at least 40 of the states and can be found as far south as the Sierra Madre Mountains in Mexico. 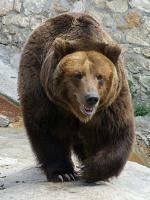 Almost all of North America at one time was inhabited by the brown bear. However, today it can be found only in a few northwestern states, Alaska and Canada. It has been listed under the Endangered Species Act as threatened since 1975 in the lower 48 states where it has been reduced to 2% of its historic range. At one time, giant panda bears inhabited most of southern and eastern China, northern Myanmar, and northern Vietnam. However, over thousands of years, hunting, climatic changes, farming and land development have continuously declined their number and forced them higher into the mountains. Their habitat today has been reduced to the bamboo forests in 6 separate mountain ranges in central China at elevations of 4,000 to 13,000 feet. They claim smaller territories than most bears, usually between 1 and 3 square miles. 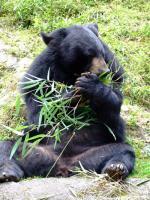 Himalayan black bears are scattered across the Himalayas from Bhutan to Pakistan. They are most populous in mountainous areas and jungles. In the wild, Kodiak bears are found only on the islands in the Kodiak Archipelago off the south coast of Alaska. They are believed to have been isolated there since the last Ice Age over 10,000 years ago. Because of the abundance of food on Kodiak Island, they have smaller home ranges than any other brown bears and have no need to defend territories. Polar bears are currently found in the Arctic regions of Alaska, Canada, Russia, Greenland, and Norway. Due to their bond with the ocean, they are considered to be marine mammals. In fact, Ursus maritimus (the polar bear's scientific name) means "sea bear." They are excellent swimmers and can swim up to 60 miles without rest. They have been seen on ice floes up to 200 miles offshore. They can also cruise at depths of 15 to 20 feet and stay submerged for over 2 minutes. The sloth bear is native to the subcontinent of India. The Indian sloth bear inhabits forested and grassland regions of India, Bangladesh, Nepal, and Bhutan. The Sri Lankan sloth bear is found only on the island of Sri Lanka in lowland forests. Sloth bears are not very competitive over territories, though they are known to leave markings on trees with their claws and teeth. They might also leave their feces at the base of trees. Tree markings are most common around breeding season, however, and may have as much to do with mating as with claiming territories. The spectacled bear of today can be found only in the Andes mountain range of South America from Venezuela to Argentina at 600 to 14,000 feet. The lowlands where the bears were once abundant were seized long ago for agricultural use. The bears are much more numerous on the eastern side of the Andes, where they are less vulnerable to human colonization. Being arboreal creatures, they prefer densely humid forests, and spend a good amount of their time in trees where they build platforms for feeding and sleeping. Though they are non-territorial, they tend to be reclusive and avoid one another except when mating or raising offspring.